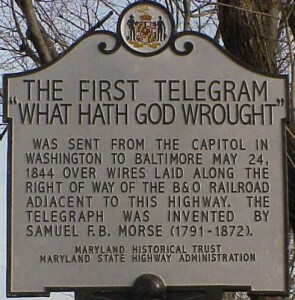 Samuel Morse sends the first telegraphic message over a line from Washington, D.C. to Baltimore. The message, “What hath God wrought!” was transmitted to his partner, Alfred Vail, who retransmitted the same message back to Morse. This formally opened America’s first telegraph line, launching America’s first form of instant communication in history. The biblical text was selected by Annie Ellsworth, the teenage daughter of the U.S. Commissioner of Patents.